With the Defenders® steel medical waste cans and step cans you get the much needed hands free flexibility that's useful for any health care environment. Economical solutions for doctors' offices and clinics these trash cans are perfect for any setting that requires strict sanitation. 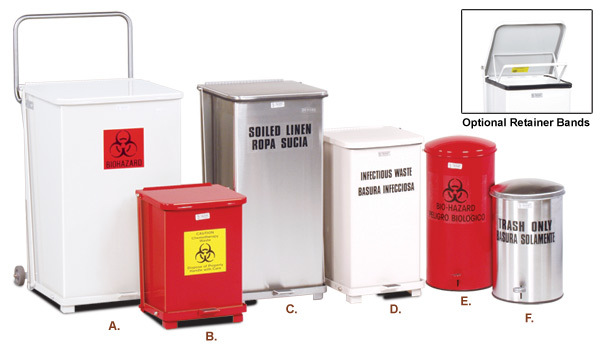 These receptacles are compliant with OSHA standards for blood borne pathogens. New step on containers are the smart choice for large capacity, hands-free waste collection. Attractive design is suitable for front and back of house application. These hands free medical step cans are available in stainless steel, black and red. Constructed of fire safe, heavy gauge galvanized steel. Choose between a rigid leak-proof liner or retainer bands to hold bags securely inside receptacle. Foot pedal is easy to locate while carrying large loads. Restraint mechanism protects walls and equipment. Steel legs with non-slip buttons to protect floors on square models. Vinyl base ring protects floors on round models. Constructed of fire safe, heavy gauge non-magnetic steel. Vinyl base ring protects floors. Available with galvanized steel or rigid leak-proof liner.